deposit. This policy also applies in cases where the reservation is shortened within 30 days of arrival. 2. There is a $25 cancellation fee for all cancellations. You, on behalf of yourself and all intended Cottage occupants during your stay at the Manzanita Cottages (together, the “Guest”) are required to agree to the following Manzanita Cottages Policies before your reservation is processed. As used herein, the Manzanita Cottages is referred to as “we” or “us”, and the particular cottage or apartment to be occupied by Guest is referred to as the “Cottage”. The area surrounding the Cottage but within the Manzanita Cottages complex is referred as the “Property”. References to “you” or “your” refer to the person completing the online reservation. We will not accept rental applications from individuals who are under the age of 21, and by submitting this application, you represent and warrant that you are at least 21 years of age. If you have any questions, please call us at 949-415-4620. We do not accept reservations for less than one (1) consecutive days. The maximum period of stay is thirty (30) consecutive days. The number of people staying in the unit must not exceed the number stated at the time of reservation without the approval of management. The maximum number of Guests in a cottage is 4 (including children). The maximum number of Guests in the apartment is 2 (including children). The names of all Guests occupying the Cottage will be provided by guest upon request. Rollaway beds, inflatable mattresses, sleeping bags and the like are prohibited. 50% of the total amount of rental and cleaning fee, as well as a 14% occupancy tax, will be charged at time of reservation. The balance will be charged no later than 3 business days prior to your arrival. Deposits are refundable if a cancellation is made before 30 days prior to arrival date. Your refund will be made within 30 days of the cancellation notice. There will be no refunds issued for cancellations made within 30 days of the arrival date, or as a result of inclement weather, flight/travel delays or personal emergencies. There is a $25 cancellation fee for all cancellations. We are not able to refund any portion of your rent if you decide to vacate the Cottage prior to your originally-scheduled check-out date. By accepting these lodging policies, you authorize Manzanita Cottages to charge your credit card up to $500 for damages to the Cottage. You are also responsible for any damages in excess of $500. There is a $250 fine for smoking on the property (see our smoking policy). Guest hereby agrees that all occupants/invitees at the Cottage will adhere to all applicable law, including, without limitation, Laguna Beach Municipal Code Chapter 25.23 (Short-Term Lodging). No drinking of an alcoholic beverage by persons under the age of 21 is allowed on the Property. Use of the Property shall not be such as to disturb or offend neighbors or residents. Parties are not permitted on the Property. Guests also agree to adhere to any rules or instructions posted in writing at the Cottage. In the event of a breach of the foregoing, Manzanita reserves the right to demand that the Guest immediately vacate the Cottage, resulting in a forfeiture of all amounts paid to date by Guest. Guest hereby acknowledges that the occupancy of the Cottage by Guest does not create a landlord-tenant relationship between Guest and us. Guest acknowledges, understands and agrees that Guest shall be solely responsible for any property damage, accident or injury to any person or loss sustained by any person (including loss of money, jewelry and other personal property) arising out of or in any way related to the Guest’s use of the property. Guest hereby agrees to indemnify, hold harmless and defend us, and our owners, officers, agents, and representatives from and against any and all claims, including those of a third party, arising out of the use of the Cottage/the Property by Guest. Guest acknowledges and agrees that we may enter the Cottage at any time to investigate disturbances, check occupancy, inspect for damages and make repairs, as we deem necessary. Children are welcome (subject to occupancy limitations, above). Pets are not allowed at the Manzanita Cottages, other than service animals as required by law. Notice: Under California law, falsely representing an animal to be a service animal carries a prison term of up to 6 months in county jail or a $1000 fine. No smoking is allowed anywhere on the property (including smoking e-cigarettes or ‘vaping’). At the discretion of management, if there is a reason to believe that the smoking policy has been violated, a $250 fee will be charged to the Guest’s credit card. The Cottage including the patio area will be carefully inspected following your departure and if there is any evidence that smoking has occurred, a $250 fee will be charged to your credit card (which would be in addition to any amount charged for damage to the Property, addressed above). Check-in time is between 3:00 p.m. and 9:00 p.m.; check-out is anytime before 11:00 a.m. Guest hereby acknowledge that we reserve the right to charge the credit card on file for one full night’s rental if check-in is earlier than 3:00 p.m. or if check-out is later than 11:00 a.m. No check-ins or check-outs will be scheduled for Thanksgiving Day, Christmas Day or New Year’s Day. The Cottage is to be left in a clean and orderly condition that is as good as when the guest took occupancy, subject to reasonable wear and tear. All litter, trash, pet waste, etc. must be picked up and disposed of in a trash bag in the outside trash cans. All doors and windows must be locked. Please wash, dry and put away all dishes, pots, pans and kitchen utensils. One parking space is assigned to each Cottage. All Guests are expected to park only in the assigned space. Your vehicle must be removed from your parking space by 11:00 a.m. on the day of check-out or the vehicle may be towed at your expense. We do not provide any oversized parking. Please click on the Check Rate button for current rates. Please note that because we cannot control the information posted on third-party travel sites, we are not responsible for honoring rates that are not consistent with the information posted on this site. A one-time $100.00 cleaning fee is charged for cottages and $75.00 for the Studio. Your Cottage is supplied with fresh linens, towels, tablecloth, etc. Guests who stay longer than 7 days will be provided with fresh linens. If for any reason the linens, towels, etc. cannot be re-used because of stains or other damage, you will be charged for replacements. We hope if you’ve stayed with us before that you’ll recommend us to friends and family looking for a place for their weekend or romantic getaway in Southern California. Each accommodation at Manzanita Cottages provides lodging in the form of cottage vacation rentals in Laguna Beach, Orange County. If you have any questions please call us at 949-415-4620. Step through the old wooden gates and down the stairs to discover one of Laguna’s most remarkable hidden treasures. Here in this story-book setting four charming, old-worldstylecottages and a studio apartment accommodation are nestled amidst fragrant floral gardens reminiscent of early California. 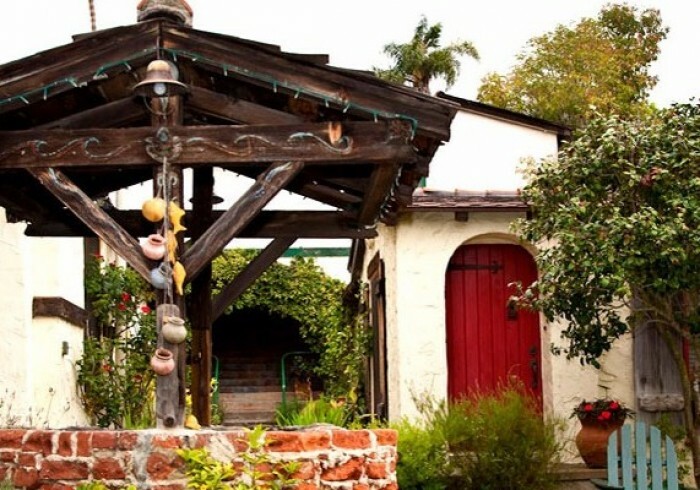 A whimsical wishing well in the center of the grassy courtyard adds special magic to this delightful and relaxing hideaway for couples looking for a romantic weekend getaway, family vacationers and business vagabonds. Tucked away in an historic Laguna Beach neighborhood, the cottages are located close enough for a stroll to the beach, shops, restaurants and galleries, and yet far enough away from the teeming activities of downtown Laguna, to enjoy a quiet afternoon rest in our gardens. Whether your journeys take you to or from the humming metropolis of San Diego or the bustling city of Los Angeles, we provide the perfect lodging for your needs! If you are simply looking for a quick escape in Southern California, let us help you have a relaxing and memorable vacation at Manzanita Cottages, nestled in the seaside city of Laguna Beach.